WARNING: Rated R for basically everything. Consider yourself warned. Five college kids get together for a weekend trip away at a cabin in the middle of nowhere. It’s supposed to be a time to indulge in scary stories, exploration, drugs, and each other without the judgement and pressures of the world. But the rush of freedom quickly changes to horror as they find themselves attacked by zombies coming out of the woods, picking off the kids one by one. What the kids don’t realize at first is that this is all part of something bigger, that there’s someone behind the scenes manipulating them and orchestrating this little calamity. And when the survivors decide to take the horror back to the source, things begin going spectacularly wrong on the end of the manipulators. . . . Will the world even survive the aftermath? Anyone familiar with Joss Whedon’s works, particularly Buffy and Angel will find a certain amount of familiarity in The Cabin in the Woods, although this movie is quite possibly darker and certainly more graphic than those shows. There’s a feeling about it that carries over though; it’s certainly Whedon’s story. The story both is a horror story–with all the blood and campiness and creeping dread that such a story entails–and also is a satire of the contemporary horror movie, pointing out the ways that such stories have gone wrong. And I kind of both love and hate it. I’m not big on the genre in general–honestly, if it weren’t for the fact that Whedon wrote it and Fran Kranz (love his character!) and Amy Acker were in it, I probably wouldn’t have bothered. Because the violence in that sort of show really feels almost pornographic to me, even in instances where there isn’t a lot of sexual content. But in this instance, that’s actually one of the things that’s dealt with satirically, so . . . yeah. I really did like the group of kids they chose; they had a good dynamic, and yeah, Fran Kranz (as a stoner idiot who may actually be the smartest of the group). The way the manipulators behind the scenes was developed was unexpected, but it definitely added a lot of interest and, while super creepy, I enjoyed that aspect of the story. The ending (no spoilers, promise) surprised me a lot, although I found it fitting. And the production of the movie itself was quite well done, with some interesting camera angles, lots of atmosphere, and tons of creepy monsters. I would definitely not recommend The Cabin in the Woods for everyone, but for those who enjoy Whedon’s work or the horror movie genre, it might be interesting to try. Liam has always been tall for his age, getting mistaken for being older than he is and being teased by other children for it. Now at the age of twelve, he’s already growing facial hair and being mistaken for an adult. Which is mostly awful. . . . But it does have its advantages at times. Like when he was mistaken for a new teacher at his new school or when he and his classmate Florida would go to the stores with him pretending to be her father. And ever one to push the limits, Liam begins to see just how far he can go with this “adult” thing–never dreaming that doing so would end up with him being stuck in a spaceship with a bunch of kids looking to him to get them safely home. 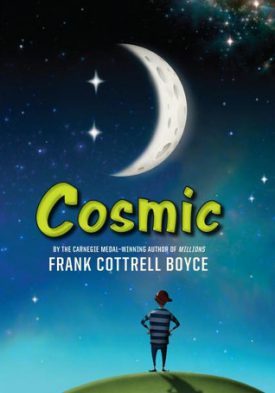 So, Cosmic was one of those books that blew my expectations completely out of the water. I had never even heard of the author previously (clearly an oversight on my part), and it appeared both from the cover and the description to be a rather average middle-grade story of hijinks and randomness. Well, the middle-grade hijinks and randomness is definitely there, but average this book is not. It uses humor and a tall tale sort of setting to look at what being an adult is really all about–as well as to examine how much the advantages of being an adult are wasted on actual grown-ups who don’t have the sense of fun and irresponsibility to really enjoy them. It also looks at major themes like fatherhood and the relationships between fathers and their children in a way that is quite touching. But the story never gets bogged down in these themes; rather they are revealed gradually through the improbable and ridiculous circumstances in which Liam and his companions find themselves. It’s very funny–perhaps even more so reading this as an adult, although this is definitely written for a younger audience and is completely appropriate for such, even for a younger elementary grade readership. There’s something of a universality in the midst of absurdity to be found in Cosmic, and I would highly recommend this book. A random act of violence ignites a war between two previously laconic and loosely organized groups of individuals. On the one hand, a group of young men who gather together for no particular reason and whose highest aspirations are to peep on the neighbor through the window and sing karaoke on the beach. On the other, a collection of somewhat older women–“aunties” if you will–united by nothing more than a common personal name. But as hatred of the other group sparks, both the young men and the aunties suddenly find themselves united against each other, motivated and inspired in ways they’ve never known before. And the heat of that fervor drives them to find more and more creative ways to rain destruction on the opposing party. 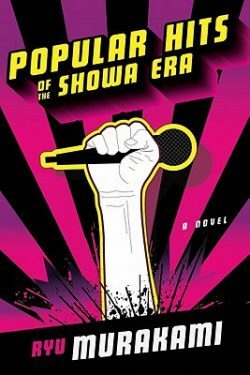 I initially found Popular Hits of the Showa Era through a review by Arria Cross@Fujinsei–which you should go read right away, because it’s excellent and informative and also fun. One of the things Arria mentions about this book is the dark humor of it, and I can totally see that it is written to appeal to a dark sense of humor. Personally, I didn’t find it funny (sorry), but I can very much appreciate that there are people to whom this book would be absolutely hilarious in a disturbing sort of way. But even though I didn’t find it humorous myself, I still found this book enjoyable in other senses. For one, it’s an intriguing commentary and satire on contemporary Japanese society, and just the flavor of the culture is interesting. Even more so, I found the psychological exploration of the book to be fascinating–the way in which the characters were just drifting through life and also the way in which this conflict affected them, making them feel alive and purposeful. I kind of think the author’s telling us something dangerous and terrifying but also important about humanity here. And I have to warn, this is NOT a book for everyone, and I would advise to approach it with caution. Because it is very, very violent. Bloody and gory and explicit and violent. There’s purpose for that in the story; it isn’t violent just for the sake of being violent. But it’s still there, very much in your face for the entirety of the story. Finally, I did want to comment on the title: Popular Hits of the Showa Era. Each chapter title is the name of a song that was popular during the Showa Era, and that song flavors and flows throughout the chapter in one way or another–not that it has a huge effect on the story itself, but it’s a nice touch. Once upon a time, our hero Knight Galavant had it all: fame, success, the love of the fair Madalena. That is, until King Richard kidnapped Madalena and she chose fame and fortune over true love. So, our hero did what any good hero would–lost himself in drink and self pity. Which is where the spunky Princess Isabella found him when she brought him a quest to save her family and win back Madalena’s love. But the road to true love and success is never as smooth as it first looks, especially for the music-loving Galavant. I think that Galavant is the sort of show to be extremely polarizing–some will adore it while others will think it’s utter rubbish. And I should say at the outset that, if you don’t like musicals, you should avoid this show, for sure. I have to compare it to a Disney movie in that regard; at any given moment, the cast is liable to burst out in song. Plus, you know, Alan Menken is hugely involved in the writing of the music, so there’s a strong Disney feel to it there also. Also, the whole focus on true love and basically the whole story line follow that feel as well. But in a more adult way (well, at least with more innuendo and language) that is oddly combined with a middle-school boys’ locker room flavor (with all the bodily noises and awkward sexuality that goes with that). Actually, looking at the story objectively, it sounds kind of awful, but in the moment, it’s kind of enjoyable. There’s a lot of humor, some of it actually funny. Plus a great deal of fourth wall breaking and commentary on current events. And the cast is actually well-picked for their roles. Personally, my favorite is Timothy Omundson, whose character is kind of pathetic and despicable both at the beginning but who grows wonderfully over the course of the two seasons. Also, he’s just a great actor, and it’s fun to get to hear him sing. 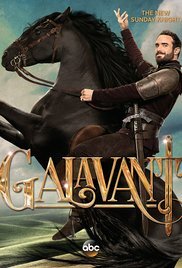 So yeah, Galavant is definitely not for everyone, but if you enjoy musicals and Disney–and are interested in a more adult-focused story in that style–it might be worth trying. Note: This series consists of 2 seasons with a total of 18 episodes. This is the story of one Ajatashatru Oghash Rathod (pronounced any number of ways, depending on who you ask), a fakir or professional con artist by trade. For years, Ajatashatru has convinced his community–even those closest to him–that he is a holy man. Now he is in the midst of his greatest con yet, convincing his followers to send him to Paris to buy a bed of nails from the IKEA store there. Things begin to go astray from his plans though as Ajatashatru 1) cons the wrong taxi driver, 2) encounters an extraordinary woman who may just be the love of his life, and 3) gets himself locked in a wardrobe on the way to England while hiding away in the IKEA overnight (to avoid paying for a hotel room). And so, this fakir begins a journey that will take him immense distances, both globally and within himself. I found The Extraordinary Journey of the Fakir Who Got Trapped in an Ikea Wardrobe after enjoying The Hundred-Year-Old Man Who Climbed Out of the Window and Disappeared (to be reviewed later). This book is similar, although I think I enjoyed Jonasson’s story a bit more. Puértolas’s story is a bit more openly satirical and just generally further from what I typically read, which made it harder for me to get into. Still, I found the story amusing and interesting. It’s an intriguing journey–both in the pinball-esque trip Ajatashatru takes across Europe, Asia, and Africa and in the internal transformative journey he takes. Probably the most interesting and enjoyable part of the book for me personally was the interactions of Ajatashatru with all sorts of people, including the variety of people he encounters and the influence they have on his perceptions of the world. The biggest negative (other than that this just isn’t so much what I typically read, which isn’t the author’s fault) is that sometimes the author seems to be trying too hard, which is partly just the book’s style, but still. 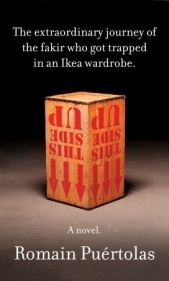 For those who enjoy picaresque, satirical contemporary novels, I think The Extraordinary Journey of the Fakir Who Got Trapped in an Ikea Wardrobe would be an amusing and enjoyable book to try. As an excuse to leave the dullness and responsibility of country life, Jack Worthing has invented a troublesome brother named Ernest who lives in the city–naturally when his “brother” is in trouble, he has to go to town to take care of him. While in the city, he leaves his true identity behind, going instead by the name of Ernest himself. And it is by this name that he becomes betrothed to the lovely Gwendolyn; imagine his horror when he finds that she has sworn to only ever love someone named Ernest! Later when Jack has returned to his country house and his ward, the young Cecily, he finds that his friend Algernon is onto him and has the tables on him quite dramatically by coming to visit–as Jack’s wayward brother Ernest. Worse still, Algernon and Cecily proclaim their love for each other, or rather Cecily proclaims her love for someone named “Ernest” just as Gwendolyn did. As Gwendolyn arrives at Jack’s country house, the four are in a right proper stew of lies and confusions–but perhaps the most surprising thing is how much truth has been unwittingly told as lies. I can’t say I’m a huge fan of college literature classes (because I’d rather read stories than butcher them), but I’m ever grateful to my school for introducing me to this jewel of a Victorian play. 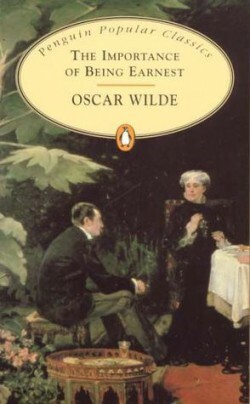 It’s this satirical, hilariously funny representation of the excesses and the absurdities of the upper classes of Victorian England, and it’s a wonderful read. (Actually, it might be even better seen on stage, but it’s fantastic to read as well.) The wordplay in the drama is brilliantly executed–the sort of stuff that will be quoted probably hundreds of years from now. (River Song even quotes it in the most recent Doctor Who Christmas special!) Some of the ideas presented are quite cutting, but they’re also absurdly funny, perhaps even more so because of how awful they are at times. It’s a lot like Shakespeare’s Comedy of Errors in the crazy confusion that the plot becomes. And the surprise ending is ironically perfect–just what the characters deserve. I think even if you’re not much into historical plays, The Importance of Being Earnest might be worth at least trying; it’s a lot of fun. Note: This play is old enough to be public domain and can be found for free on Google Books and on Project Gutenberg.